In its never-ending quest to stay ahead of the competition, General Motors has announced the addition of a new feature to its best-in-class OnStar telematics system. In the coming months, owners of most new 2011 GM products will get the ability to control key vehicle functions from their Apple iPhone or Google Android smart phones. 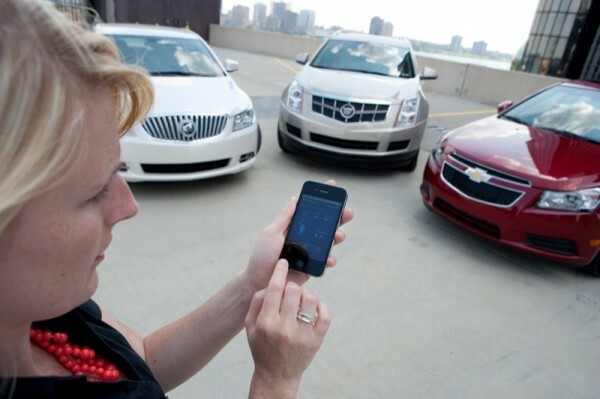 Each GM brand, including Chevrolet, Buick, Cadillac, and GMC, will release a branded app that will allow the driver to activate all of the functions available on a traditional GM key fob, including remote start, horn, lights as well as door lock and unlock. What’s more, the apps will provide key diagnostic information, including fuel tank level range, remaining oil life, current and recommended tire pressure, and lifetime average miles per gallon. Information such as the vehicle’s current odometer reading, VIN, and OnStar account number will also be readily accessible through the apps. The diagnostic details displayed in the apps are current as of last vehicle start. At the end of the day, these apps no longer require the driver to be within a requisite distance or even have the keys with them to control the vehicle. And just in case an OnStar subscriber needs assistance with something that the mobile apps don’t provide, they will be able to call a trained OnStar advisor 24 hours a day, 7 days a week – all at the touch of a single button within the app. Moreover, GM’s press release says that the Chevrolet, Cadillac, Buick, and GMC mobile apps will offer other brand-specific features that will be revealed as the the apps come to market in the coming months. It may very well be that the first functioning app of this kind will be the already-announced app for the Chevrolet Volt. Put simply – this is amazing! Witness the very first wide-scale integration of car, cloud apps, and smartphone. By now, it should be obvious that OnStar is one of those GM technologies that is a tremendously advantageous asset to The General. Say someone is racing to catch a flight and realizes at the gate that he forgot to lock his vehicle. OnStar’s mobile app technology allows him to log into his Chevrolet, Cadillac, Buick or GMC app, enter his custom PIN and send a remote lock signal to his vehicle, giving him the peace of mind to go on with his trip knowing his vehicle is secure. Or, for example, a family attending a baseball game on a hot summer day could remotely start their vehicle as they are leaving the ballpark, so the vehicle is cooled to a comfortable temperature by the time they reach it. I don’t think it’s that scary. Whoever would like to “hack,” would need to do so to OnStar – which is a collection of very proprietary systems very few have access to. On top of that, the apps on the iPhone/Android are simply controls for the central OnStar system – so that’s where the hackery would have to take place. At this point, I would recommend that everyone who uses a smartphone use a code to protect their phone, which helps tremendously in the case of theft, loss, etc. The article says “2011”, I just bought a 2010 Traverse and I wonder if it will work with my new vehicle? I am sure OnStar can update my vehicle’s firmware to allow the app to work. Anyone heard anything regarding 2010 vehicles? We know it will work for 2011 models, but don’t yet know anything about 2010s. Let us send something to our contacts at GM and check it out for ya. Can I use the On Star app on my Android phone for my 2010 Buick Lacrosse? Richard – the app isn’t yet compatible with the 2010 LaCrosse. We are meeting with a few folks from OnStar next week to find out whether the two will ever work. Stay tuned – I will let you know on here! i am buying a 2011 silverrado, does it have to be a factory installed remote start, or will any aftermarket starter work? I would be surprised if it did work with an aftermarket unit, since the entire system is integrated into the OnStar hardware.